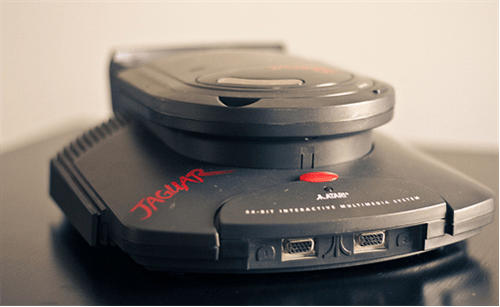 Released in late 1993 the Jaguar was the last console from Atari. Whilst calling it an unmitigated failure might be taking it a bit far, the Jaguar was definitely not the success that Atari was hoping for. It was officially released in only a few countries: the United States, England, France, Germany and a limited release in Japan. It sold fewer than 250, 000 units (even the Atari 7800 sold around three million). Its controller is often derided as the worst ever (not true in my opinion – the Atari 5200 and Intellivision controllers are both worse). Several announced peripherals weren’t released (the Virtual Reality headset, the Voice Modem…) and the Jaguar CD was released too late and had limited software support. Most importantly there were few games released during its lifetime, they were often late due to poor development tools, a buggy chipset and the machine generally being considered difficult to programme for. There were also numerous simple ports of Amiga, PC or MegaDrive games that didn’t look like they belonged on a ’64-bit’ console and many announced games were never released or were cancelled. Conversely the 3DO, which was released around the same time and was much more expensive and technically not as powerful as the Jaguar, was home to numerous ‘next generation’ titles that showed off the power of the system. EA was responsible for many of these games such as FIFA Soccer, Need for Speed and Road Rash. They really went the extra mile in graphical and audio presentation, options and game play, thereby heralding the type of presentation and effort expected by consumers in the PlayStation era and beyond. Few of the companies creating games for the Jaguar (including in-house Atari games) could match these efforts. By 1996 the Jaguar was all but dead in the console market. The Jaguar: Sleek, smooth and (with CD attached) kind of toilet-looking. Despite all of those things, the Jaguar was home to a number of fantastic and often unique games. There are more than enough titles to make it worthwhile for the gamer who wants to try some interesting games from one of the last consoles released before the mid-nineties explosion of dedicated 3D gaming machines. To this day the dedicated fan base has a number of homebrew developers releasing games, development tools and hardware. There’s a solid, though somewhat fragmented, online community of enthusiasts and developers. The base systems can be obtained online for a very reasonable price even though the Jaguar CD is expensive, has a limited number of games and a reputation (somewhat deserved) as being a bit flaky. The six button Pro-Controller is very good and highly recommended over the standard controller, however they’re difficult to find at a price less than $80. The games vary wildly in price (though most can be had for the very reasonable amount of $5 – $50 a piece) and a few of the rare games could run you into the hundreds or even thousands (yes thousands!). And that’s if you can find them. Obviously that’s the exception not the norm, but I thought fair warning was in order. The Pro-Controller (right) is much better than the standard one. So, you’ve decided to take the plunge but don’t want to waste time on the poor games (Trevor McFur, Club Drive, and Checkered Flag spring to mind. I own them – avoid!). What games are worth getting? Check out the following which in my opinion are all are good games (even considering their mid 90’s heritage) and the gameplay still holds up today. The first AvP game by Rebellion software who went on to create the PC versions. Play as either the colonial marine trying to wipe out the xenomorphs, face-huggers and Predators, an Alien trying to rescue the queen from the Predators or a Predator out to wreak some havoc. Although it has a bit of a ropey frame rate (during development it was much higher, but in-game logic slows it down…apparently) and some other minor issues, it’s well worth obtaining. The tension and atmosphere are great, so much so that Gametrailers ranked it as one of the top ten scariest games of all time (link). The gameplay is a bit more cerebral than Doom and its contemporaries and it was quite a remarkable technical and graphical achievement in 1994. Battlemorph playthrough – check out the cheesy Sean Connery impersonation. The CD sequel of the often derided pack in game Cybermorph is a much more complete and varied experience. Fly your ship above ground or under water, shoot enemies, solve puzzles, rescue pods, listen to the beautiful audio and laugh at the wannabe Sean Connery impersonator during the cut scenes. A great game that holds up well even today. This game still looks amazing given the hertige. Not much gameplay in this video though. The potted history of this game (and the upgraded Gold version) could well fill several thousand words…not today though. In a nutshell it’s a space shooter along the lines of X-Wing/Tie Fighter with a smattering of Star Raiders thrown in. It is possible to network up to sixteen Jaguars and have thirty-two players in one game (though obtaining the funds for this many copies of the game and the hardware to do this would probably require selling a car…or a body part or two). The graphics are silky smooth, there’s a lot of love in the audio department, a number of varied modes of play (both goal based and open ended), heaps of varied weapons and several Easter eggs to be found. It was lovingly created by a very small team, was only released after the Jaguar’s commercial life had ended and well deserves its place among the top Jaguar games for both its gameplay and as a hallmark of the technical capabilities of the console. It is also very difficult to obtain…and if you find it prepare to spend some crazy money. Good luck in finding it. I have a copy, but no I’m not selling it. Cannon Fodder is oddly hilarious. Released on every console and computer under the sun during the mid nineties, Cannon Fodder is a great game that is well worth playing even now. If you don’t have it (or its sequel) in any other format, the Jaguar version is as good as any other (sans mouse support unfortunately). Defender 2000 review showcasing all three modes of play. Though this game isn’t without its faults, I feel it’s a worthwhile addition to the Jaguar library. As he did with Tempest 2000, Jeff Minter created a game with three modes: Arcade (pretty close to Eugene Jarvis’s original), Plus (which is like Defender II / Stargate, but with trippy graphics) and 2000 (which has vertical scrolling and a bigger ships – both controversial changes that make the player rely on the radar a little too much). I like the gameplay and the music, though I find the controls a little twitchy. Definitely a ‘zone’ game – get in that place and you’ll have some fun with this one. It’s the original version of Doom. More colours than the PC version, but slightly simplified textures and levels, with a couple of enemies missing. Back in the day it was the cheapest way to play the game shy of owning $2000 PC. An action/adventure game in the same vein as Alone In The Dark. The controls are occasionally clunky and the game itself is somewhat short, but I had some fun with it. Two sequels were planned with one being completed, but this was the only one of the three released. Iron Soldier 2 full motion video introduction. So 1990’s. Play as a lumbering forty foot mechanised robot. Shoot helicopters. Destroy buildings. Stomp on tanks. Get new weapons. Very good, lots of fun and rather challenging (the sequel is especially difficult). Definitely must have, high priority games for a Jaguar fan and as you probably can tell they are definitely amongst my favourites. IS II was released on CD and cartridge (sans music and FMV) with the original available on cartridge at a very reasonable price from most retailers. only plays on easy so the game ends after three levels. …and here’s an interview with the owner of one. Originally designed for the unreleased Virtual Reality headset this game contains the arcade classic, a 3D interpretation (not so good as it was only coded in a short time frame at the behest of the game’s producer) and the Virtual Version which is a cracking game, albeit with a slightly inconsistent frame rate (due to a little too much texture mapping, again included at the insistence of the game’s producer). Under constant attack from above you shoot your enemies from three turrets in three distinct locations (under the sea, in the mountains and in space). No walkover, this is a challenging and technically solid game. I conducted an interview with the lead programmer many years ago, I’ll need to dig it up sometime. Welcome to NBA Jam. Tonight’s matchup is Cavaliers vs Kings. This is the best home edition of the ‘classic’ version of this game. Much better and cleaner audio than either the SNES or MegaDrive versions and no loading time unlike its PlayStation and Saturn contemporaries. Using the Team Tap you can play with up to four players. Power Drive Rally in action. An overhead racing/rally game that’s graphically, sonically and in terms of gameplay superior to its 16-bit counterparts. It might not scream “64-BIT POWAAAR!! !”, but it’s good fun. This Defender alike, released after the Jaguar’s commercial end, is a fun and intense shoot ’em up that bests even the Jaguar’s Defender 2000. Worth tracking down, there are slight differences between both versions. I created a reworked song (late 90’s drum and bass style) for the Special Edition release of the game, but I never submitted it for inclusion…d’oh! Some nutter does all of Raiden in one life. Four more videos follow! It’s Raiden. No it’s not quite arcade perfect (very close though). No it’s not a massive technical achievement. No it doesn’t contain the sequel like the PlayStation version. But it’s Raiden! One of the first crop of Jaguar games released and it’s a cheap buy. they’ve messed up the PS1 video capture here. Whilst ever so slightly technically inferior to the PlayStation and Saturn versions (less parallax scrolling, less sparkly things, weaker audio), it’s still a wonderfully charming and beautiful platform game. If you don’t have any of the other versions and you have a Jaguar, you owe it to yourself to grab a copy of this one. he mentions, but caveat emptor. Somewhat like the PlayStation’s G-Police but with a bit of Descent thrown in for good measure. In Skyhammer you pilot a ship that flies around a Bladerunner-esque city…and, naturally, shoot stuff. There’s a lot of game to be had here: two distinct modes of play (Mission and Battle), three huge cities and upgradable ships and weaponry. It has very decent graphics considering that it was made for a twenty year old console from the pre-PlayStation era (there’s no mistaking this for a SNES title! ), but the frame rate is a little low and there are a couple of known glitches. I found the dude talking through this to be (unintentionally) hilarious. He loves the game…but ‘Jagwire’? A silky smooth but somewhat shallow track-based motorbike racing game. Think of a prettier version of Sega’s Super Hang On. It can’t hold a candle to even mobile phone racing games of today, but it’s not too bad if you like fast, fun, straight forward, old school vehicle racing. Critical acclaim is still heaped upon this game almost twenty years after its release. Still shots and YouTube videos don’t do it justice. The smooth movement, the colour shading, the fantastic rave inspired music of the soundtrack, the ability to play it with a hacked rotary controller and the 100 normal levels + 100 ‘Beastly Mode’ levels all add up to a well balanced update of the old school arcade classic. A first person 3D dungeon crawler/RPG, Towers II is a game worth sinking some time into. The first person perspective works well for fights and for a game of its age it looks okay and plays well (though you may be wishing for a mouse rather than a joypad). Annihilations, fatalities and poopality. Wait, what? The Jaguar had a bit of a bad run with fighting games (which were all the rage during the time of its release). Kasumi Ninja looked the part, but was rather poor. Fight For Life visually aped Virtua Fighter, but its gameplay was off. As for Mortal Kombat 3, it never arrived as announced. Ultra Vortek holds the mantle of the best Jaguar fighter and the characters are either digitised, stop-motion animated or computer generated and fight in a bunch of fantasy locations. Though there are less than ten characters overall (unheard of these days), they’re varied enough to hold your interest for a while. It’s not MK, but it’s worth a shot if you can find it at a reasonable price. It’s Wolf 3D at four times the resolution of the original. Did you know that the original ran on 286 PCs? You had to make the game screen about the size of a postage stamp. But it did work. Footage of the HIT-PAK mode and Trench (lasts 90 seconds). Not fast enough? Some crazy freak playing it on an overclocked Jaguar! An arcade style space shoot em up, Zero 5 is a fun and challenging ride that successfully transfers simple early 1980’s arcade game concepts to 3D. There are three modes scattered throughout the game: BAMBAM (think 3D Galaxians where you view from a fixed perspective but move your ship in 3D space), HIT-PAK (3D Missle Command / Asteroids style) and Trench (Star Wars/S.T.U.N. Runner-ish). Fun, fast, smooth, loud and difficult (auto-fire would’ve been much appreciated). Great music too. Highly recommended. Is the Jaguar worth acquiring? In my opinion, yes. And I haven’t even touched on the ever burgeoning homebrew scene, which I’ll address in a future article, with dozens upon dozens of original games as well as ports having been released over the past decade. Emulation is possible, but it’s still technically not quite there yet, especially on non-cutting edge computers. Although the Jaguar wasn’t released in Australia, they’re easy enough to get online. Unfortunately since this article was originally written, the prices have headed skyward. Still, bargains can be had, and the occasional units show up locally. Until you many get find one, give the Atari Age Jaguar section a look over ( http://www.atariage.com/Jaguar/ ). PS: Many thanks to the creators of these YouTube videos. Check them out for links to more retro gaming goodness.